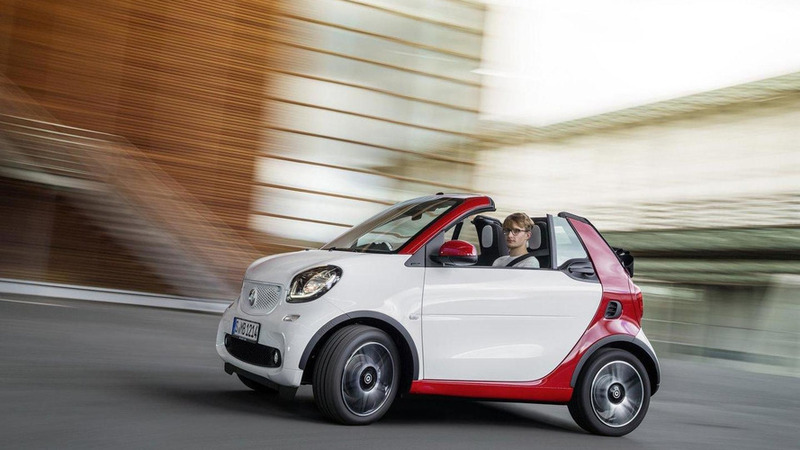 Based on the Fortwo coupe, the convertible features a familiar design but adopts a smaller B-pillar and a "more progressive" tridion safety cell. However, the biggest change is the addition of a power retractable canvas roof which opens in just 12 seconds. The roof is available in three different colors - black, blue denim and red - and features a glass rear windscreen. At launch, the model will be offered with two different three-cylinder engines that have outputs of 71 PS (52 kW) and 91 Nm (67 lb-ft) of torque as well as 90 PS (66 kW) and 135 Nm (99 lb-ft) of torque. They can be connected to either a five-speed manual or an automatic twinamic dual clutch transmission. On the topic of performance, Smart says the model's torsional strength has been increased by approximately 15 percent. In order to achieve this, engineers added a number of chassis reinforcements including a crossover bar, two torsional bulkheads and high-strength steel tubes in the A-pillars. The Fortwo Cabrio will go up for order in Germany in November and the first delivers are scheduled for February.